Andre Thieme and Cesar on course in Sunday's $50,000 HITS Grand Prix, presented by Pfizer Animal Health. OCALA, FL (February 22, 2011)-- The Ocala Winter Circuit had a record-breaking weekend as the $50,000 HITS Grand Prix, presented by Pfizer Animal Health, had the largest Grand Prix starting field ever seen in Ocala with 50 competitors in the tack. Sunday's record came on the heels of Thursday's $25,000 SmartPak Grand Prix, presented by Pfizer Animal Health, which set the record at 48 starters. 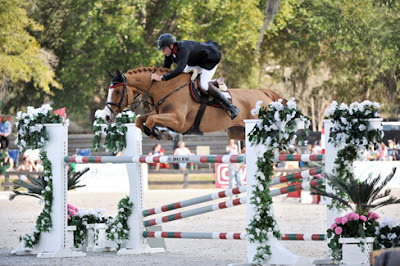 Andre Thieme of Plau Am See, Germany, and his own Cesar captured the top prize in the $50,000 event to highlight the week of competition at the Ocala Winter Festival. Sunday's course was designed by Jack Robson of Coronado, California and saw 12 teams return for the jump-off, with only three going double-clear. Thieme had two of those efforts, first aboard his own Uvalier, and next aboard Cesar in 33.772 seconds to capture the win. "Cesar is usually a very fast horse," said Thieme. "Today he didn't seem as fast in the first round, but was very careful and left everything up. I was very pleased when I brought him back for the jump-off, as he jumped careful and had great speed to the finish." The top three ribbons had a German flare, as first to show in the jump-off and setting the Great American Time to Beat in 35.909 seconds was Matthias Hollberg and Apex Equestrian Center's Wadisson. Hollberg, also of Germany, now resides in Apex, North Carolina, and operates Apex Equestrian Center. 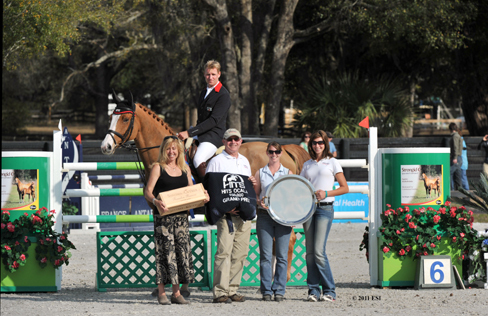 Hollberg won the $50,000 Charles Owen Grand Prix, presented by Pfizer Animal Health, at the 2010 Ocala Winter Festival aboard Full A's. "This was the same week I won the Grand Prix last year in Ocala," said Hollberg. "We came so close! I'm really excited this year to be showing Wadisson. We've only been showing together for less than a year, but he has a ton of potential and I'm very excited about what he can do." At the Culpeper Finals in 2010, Hollberg and Wadisson took second place in both the $15,000 Brook Ledge Open Prix, and $40,000 HITS Grand Prix, presented by Pfizer Animal Health. In the United States, Thieme has quickly become recognized as a top performer. His equine career started in Germany as a young dressage rider, who then traveled to the United States and began competing in the jumper divisions. Now, he continues to boast a successful career as an International competitor, with several notable wins and finishes under his belt. Last year, he and Cesar, a 9 year-old mare, won the $75,000 Strongid C 2X Grand Prix, presented by Pfizer Animal Health, during the Ocala Masters. Two weeks later, he traveled to Thermal, California and placed fifth aboard Aragon Rouet in the $300,000 Lamborghini Grand Prix, presented by Lamborghini of Newport Beach, which helped to cement his spot in the top 20 of the 2010 Pfizer $1 Million Grand Prix Rider Rankings. Thieme continued to show with HITS throughout the season, racking up ribbons and prize money along the way, and eventually placed ninth in the Pfizer Million aboard Aragon Rouet. This year, Thieme has returned to the United States to once again pursue the richest Grand Prix in history, the Pfizer $1 Million Grand Prix. Sunday's Grand Prix marked his fourth Grand Prix on the road to the 2011 Pfizer Million, and so far this season he's consistently placed on two mounts in each event, with Sunday's outing being his best yet with a first and third place finish. "The High-Performance riders from around the world have shown an overwhelming response to the Pfizer Million," said Tom Struzzieri, HITS President and CEO. "Last year's event was a success and the interest for this year's continues to grow at our winter circuits in Thermal, California and here in Ocala. This event was created to give unprecedented opportunities for riders in the United States, and it's clear that the interest and appeal has been embraced globally." Thursday's winner of the $25,000 SmartPak Grand Prix, presented by Pfizer Animal Health, Kent Farrington, had the fastest time by far in Sunday's class with 33.485 seconds, but dropped a rail mid-way through the track and finished fourth aboard Haity McNerney's Valhalla. Farrington brought four horses to Ocala this year and so far has fared well against the stiff Ocala competition, taking home a total of four ribbons in the Grand Prix ring last week, and more than $15,000 in prize money. Rounding out the top five in the class was Roberto Teran riding King Ridge Stables' Grande Finale 3E, who edged out Aaron Vale and Quito by less than a tenth of a second to push Vale into the number six spot. HITS' Lisa Engel, Dr. Andy Clark (CEO of Hagyard Veterinary), Dr. Heather Woodruff and Ms. Arwen Price, all on behalf of presenting sponsor Pfizer Animal Health, presented the awards and a cooler courtesy of Shires Equestrian Products to Andre Thieme and Cesar in the $50,000 HITS Grand Prix, presented by Pfizer Animal Health. Thieme also received a bottle of chardonnay courtesy of Sonoma-Cutrer? Wines. With the win, Thieme now has four of the eight Grand Prix needed to become eligible for this year's Pfizer Million and $15,000 in prize money aboard his leading horse Cesar. Maryland's Tracy Magness currently holds the number two spot in the current Pfizer Million Rider Rankings with six of the eight Grand Prix needed to become eligible and $23,750 in prize money aboard Tarco Van Ter Moude. Ocala was blessed with some picture-perfect weather for the past couple of weeks, and it appears that another delightful forecast is in store for this week's competition. The Ocala Masters begins tomorrow and will be highlighted by the $25,000 SmartPak Grand Prix, presented by Pfizer Animal Health, on Thursday, February 24, the $5,000 Devoucoux Hunter Prix on Sunday, February 27, and the $50,000 Strongid C 2X Grand Prix, presented by Pfizer Animal Health, on Sunday, February 27. All Grand Prix and Devoucoux Hunter Prix events this season are qualifiers for the 2011 Pfizer $1 Million Grand Prix and the inaugural Diamond Mills $500,000 3'3" Hunter Prix Final, respectively, which will take place September 10-11 at HITS-on-the-Hudson in Saugerties, New York.